Please feel free to compare our stationary printing prices, leaflet printing prices and flyer printing prices to our competitors. You will certainly find we offer the cheapest business stationary, letterheads, comp slips, flyer and leaflet printing prices in the UK, on a like-for-like basis. Premium 130gsm / 170gsm / 250gsm FSC paper with Gloss or Silk finish Standard A6 size (105.. 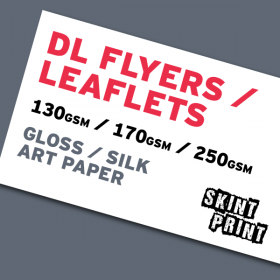 Premium 130gsm / 170gsm / 250gsm FSC paper with Gloss or Silk finish Standard DL (1/3rd A4)&nbs.. Premium 130gsm / 170gsm / 250gsm FSC paper with Gloss or Silk finish Standard A5 size (148.. Premium 130gsm / 170gsm / 250gsm FSC paper with Gloss or Silk finish Standard A4 size (210..